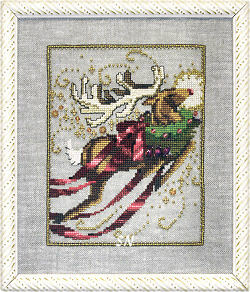 from Homespun EleganceHomespun Elegance has a new Cinnamon Stick Design, and this year, it's Santa, stitched in tons of pretty threads on 10ct Tula! Calling for Weeks #5 Perle Cottons, Rainbow Gallery's Wisper for the fur and beard, and lots of flosses, he finishes an impressive 10 x 13... so he makes a generously-sized pillow! Santa's gift list is for a lucky stitcher. It reads, Samplers to Stitch, Sweaters to Knit, Rugs to Hook, and Quilts to Piece. Offered as a chart, we have all the cute embellishments (a wooden spool on here, some tiny scissors, brass buttons, etc) included, as well. Very cute, this one BELONGS in the home of every stitcher!!!! I just want to highlight -- in one place on our site -- Nan's lovely collection of Christmas Stockings. Each have been annual releases, and cover 8 years! Timeless designs, each is prettier than the last. Lots of horizontal bands, pretty stitches, beads and crystals, you'll notice that the top bands do not feature names. If you like, you can add that to the top of each... but I like that small tag that can hang off the side... a really classy way to announce the owner! Little Victor -- Nan's first grandson -- arrived almost 5 years ago, and his stocking does differ from the rest. He has that darling teddy bear, and lots of tiny motifs from Nan's other Christmas designs! More color for Victor -- he IS kind of a bold little personality -- so he deserves to be different from the rest! Anyway, quite an eye-catching collection of elegant stockings, totally different from the usual whimsical stockings available... stunning hanging from an elegant, traditional mantle! Each is offered as the leaflet with embellishments. By The Chimney from Prairie SchoolerThe Prairie Schooler presents their 4th annual Santa kit! (no... the small annual card #25 for 2008 is NOT here yet... we'll let you know when it comes!) Designed for Crescent Colours hand-dyed flosses... each year, these are stitched on 28ct Natural Linen, and finish approx 5 x 8. This year's limited edition design is stitched with Cupid, 3 skeins of Blackbird, 2 skeins of Spinach, and one each of Magnolia Blossom and Rosy Glow. I love the scene... I think this is the best of the 4 designs so far!!! Offered as the chart, linen and flosses, we do still have 2005, 06 and 07 available. They are limited in production, so I don't know how long the previous designs will be offered to us. THIS ONE IS CUTE!!! The Christmas Needlework Shop and Holiday Carols! 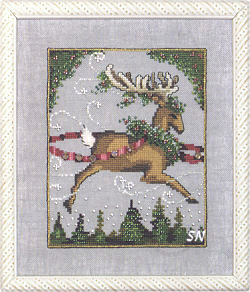 from Mill HillMill Hill has released the 2008 set of Christmas Button & Bead kits... we've been treated to these for years and years, and this set is one of the BEST! We have two new additions to the 12-pc Christmas Village Series -- Carolers and the Needlework Shop! The four new Carols are stunning!!! Jingle Bells, Deck the Halls, Silent Night and Joy to the World are very eye-catching, and so full of bold design element. Wonderful color, the words are plain, each design is full of pretty stitch and bead detail... and I think you could even stitch the middles of each design as individual ornaments! Always offered as complete kits of 14ct perforated paper, the chart, flosses, lots of beads and a Mill Hill hand-made button, each finishes approx 5 x 5. Our shop models will be presented on 28ct linen, like always, so we've chosen fabric colors that match the original paper background colors. You're going to need all of these!!! Presenting the Nutcracker Ballet! 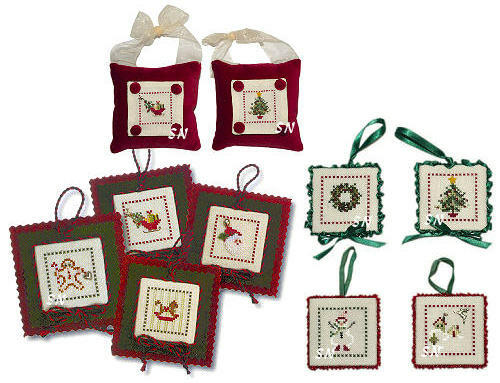 from Mill HillMill Hill has released a wonderful set of 6 small ornament-sized beaded and stitched decorations for Christmas! Celebrating the Nutcracker Ballet... each 3 x 4-1/2 ornament is stitched on 14ct perforated paper with DMC flosses and Mill Hill beads. Offered as individual kits, we have Uncle Drosselmayer, Clara, The Mouse King, The Nutcracker, Sugar Plum Fairy and The Prince. Stitch just one or two, or all six for your tree.. they'd be kind of fun hanging in the same general area. They don't use any metallic threads, and I personally think there are lots of places that you could add some -- just for fun. See what threads you have in your stash, and get to work! Think about stitching a whole army of Nutcrackers -- you could change uniform colors. Think about stitching the Sugar Plum Fairy for all the little girls in a dance class! This is a timeless set of great little ornaments! Offered as complete kits of chart, perforated paper, flosses, beads and glass Treasure embellishment! 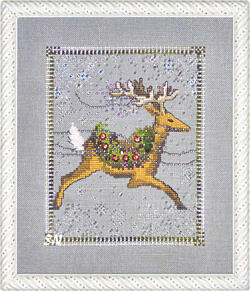 Christmas Eve Couriers from MirabiliaMay we present a most charming set of Santa's Reindeer??? By Mirabilia's Nora Corbett, this is an exquisite set of 8 charts -- each of one of Santa's devoted reindeer -- dressed and ready for Christmas Eve's Special Deliveries!!! 'On Dasher, On Dancer, On Prancer and Vixen... On Comet, On Cupid, On Donner and Blitzen...' Comet, Prancer finish the set! Here's Big Nick's Main Squeeze -- Big Mama!!! This is a darling companion to Big Nick -- published by Sisters & Best Friends. AB Designs is half of 'Sisters'... who are still *sisters* and *best friends*... just not a team of designers anymore. They each have their own company... so now its kind of fun to look back at the Sisters Page, and guess who really was behind which design!!! Anyway, here's Big Mama... waiting for her man with a big 'ole Christmas Pudding on her lap! Check out the reindeer slippers! There are more snowmen you can see through the window in the background, and even though the wallpaper is the same... the friends in the room have changed. 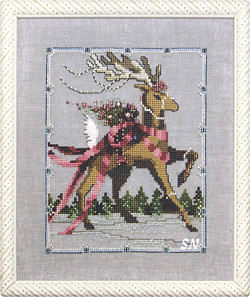 Offered as the chart with lots of fun bead embellishments, she measures approx 12 x 12 on 28ct. Pretty colors... lots of visual impact!!! 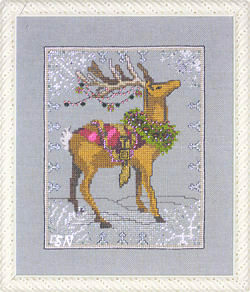 from Shepherd's BushA little angel-shepherd on her Christmas Journey... Tina's tiny design for Christmas 2007 is stitched on 32ct Medieval Green in 9 shades of solid and hand-dyed silks. A deep grape, and lots of softer mauves, moss and buttermilk, the 3 x 4-ish design features a few easy stitches and a small yellow star embellishment. 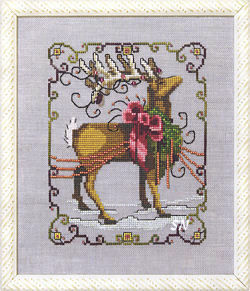 Actually quite finish-able in time for Christmas... the complete kit contains the chart, linen, silks, needle and star. Three other designs have been released along with 'Come'... so check 'em out, too! Artist Michael Powell has been charting his delightfully whimsical houses and village scenes for a few years now.. but is finally offering his creativity in chart form, rather than full kits... and we are THRILLED! So many charming design elements in each piece... I love the snowcapped roofs of the Winter Village set, the cobblestones in the Summer Set, and the heart-shaped street lamps of the Venice Set! Offered as charts, each finishes the same size, approx 7 x 8 on a 28ct. Stitched in whole crosses, what gives these so much flavor are the bright colors, and the displaced backstitch. You get lots of crooked little lines and shapes, lots of fun interest, lots of 'relaxing' buildings... I just love all of these!!! They fit my idea of the perfect little bustling European Village -- right out of a picture book! An intricate Christmas sampler... this features lacy Whitework and a bit of Hardanger all tucked between bands of the Angels on High, the Shepherds Watching their Sheep, the Three Wise Men, and Jesus in the Manger. 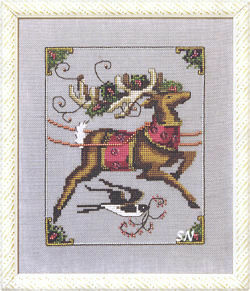 The story of Christmas is told band by band, stitched in silks and metallics on 28ct Smokey Pearl Cashel Linen. Finishing approx 5 x 23... study the bands a bit... there are so many small border designs in this... each of the special scenes could be stitched by itself for a neat little stand-up... connect it all horizontally... it fits! Victoria Sampler is delivering another exquisite piece. The *huge* Accessory Thread Pack is a 'Who's-Who' of silks, metallics and embellishments! 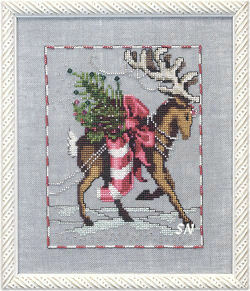 Lovely charts, diagrams and stitches, it promises to spark lots of Christmas memories! Very traditional and elegant in feel, the colors feature rich browns, deep reds and greens, along with lots of glistening gold beads and metallics! Offered as complete kits of chart, needle, paper, flosses and metallics, beads and charms, these are really a bargain because of all the colors of threads and beads included! Lovely! The Christmas Village in Buttons & Beads from Mill HillOh gosh... Mill Hill has designed 6 new houses to join last year's Village series of Button & Bead kits! These are DARLING!!! Offered as complete kit on 14ct brown perforated paper, loaded with beads, flosses and a ceramic button or two, last year's set was so popular... that I know this year's will be too! Stitch them all individually (we love to use 28ct Natural Linen) or stitch them together in a long strip... they are elegant! Queen Anne has frosty blue colors and candles burning in all the windows. Skating Pond is a 'break' in your village... it's part of the activity happening outside! General Store has peppermint posts! Apothecary is lit up -- might be a 24-hr pharmacy! St Nicholas Cathedral is white and glisteny. Lots of white and ice beads in this one! Village Bakery is closed... but it's sign is a delicious gingerbread man cookie! Very well done... pick a few from last year, and add some from this year... and watch your tiny village grow and grow! from Mill Hill Every year, Mill Hill does 3 old-time Santa ornaments in simple cross stitch with a little bead embellishment. This is the 9th year to add to the set of Musical, Mountaineer, Polar... all of the previous 24 are pictured on our MH Kits pages. Stitched on 14ct Perforated Paper, each finishes approx 3 x 4-1/2, and makes a charming hand-made addition to any Christmas tree! Allegheny has a teddy bead in his sack, Blue Ridge is holding a racoon and Smoky Mountain features a cat. Simple, with Olde World appeal... we keep selling the first year's set just as much as the newer ones!!! They are an awfully good value, as well... maybe that's why! Stitched on 28ct Smokey Pearl Cashel Linen, the accessory pack features 22 different colors of silks, overdyed flosses, #4 metallic braid, and, more silks! The embellishments include seed beads, tiny pearls and star sequins, as well. Offered as the leaflet with accessory packs, our colors of silks have arrived!!! (So when you order, we'll have to send that pack in a few weeks. Don't know the price -- you'll have to be a bit brave with that!) Your busy Christmas Village finishes approx 16 x 10, and most surely will become a treasured Holiday Heirloom. Big Nick from Sisters & Best FriendsSisters & Best Friends' newest Big Santa... he goes with the other 4 they already have published! Packed FULL of bright, cheerful color, this year's Santa features beaded trim on his package and a beaded rope -- with Swarovski crystals -- that closes his bag. Check out the tiny mouse perched atop the kitty... all in front of the window! Offered as a leaflet with embellishment pack of beads, crystals, clay peppermint and holly, some stars and buttons, Big Nick measures approx 12 x 12 on 28ct, and is stitched in regular DMC flosses. I just love the colors and the shading... such a big puffy chair, such cute trees and that sack... and such a teeny little face on Nick! Charming! JBW has 4 other small designs that are new... visit our pages to get a peek! Just Nan has released her 15th angel... and this time... we have a border that surrounds Ariel, and all of her predecessors! Offered as a leaflet, Ariel is the same petite and delicate angel Nan has always designed for us. 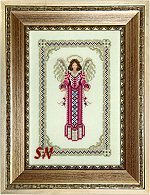 Her border is universal to the rest of the angels, and the leaflet supplies color conversions for highlights in that border, so it will compliment the angel of your choice!!! Ariel is also another angel option for the center of Nan's Angel Stocking design! 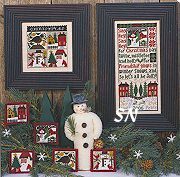 Five more ornament-sized Holiday motifs are gathered together in the Christmas Sampler version of Prairie Schooler's new set of Foursomes! The partridge is cute, the snowmen are, too... I like the way each comes to the very edge of the design. It fills up your ornament... you know if you do those individual squares over one on 32ct, they will measure only a teeny-weeny INCH in size!!! How cool is that?! 'Up on the housetop click-click-click, Down thru the chimney with good Saint Nick.' 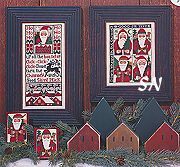 The 4th in the new Prairie Schooler Foursome set of designs... this features the main sampler the same size as the Autumn, Winter and Christmas designs... but its foursome of Santas finishes slightly larger (5 x 7) than the others. Same great PS colors, I really like that portion at the bottom of the main piece... you could taker that out and just stitch IT! ... or the Santa at the top coming out of the chimney! The 23 Annual little Santa card has arrived... and this year our Man-of-the-Season is sewing stockings! In the same small card format as every other year, same color scheme, this year's is a charming addition to the set! We have all the rest of the previous designs available... STILL! Prairie Schooler has re-printed past years in a 9 x 12 format with 4 years of Santas together, as they have run out of the single cards... so you may have to double up on one of two to get the whole 23 year set. Over the years, we've seen these done into Afghans, bell pulls... you name it. Kind of special remembrance for me, personally... Prairie Schooler was a new designer at the second Market I ever attended, in Atlanta, in the Summer of 1984. They created quite a stir... and introduced their first Santa card at that show! Also of note, are the two Limited Edition Santa Kits that Prairie Schooler began last year. Both are currently available -- they are offered as the design along with complete skeins of Crescent Colors hand-dyed flosses, linen and needle. A special thing for PS simply because they have always used a DMC color palette... both the 2005 and 2006 Santas remind me of those in Good Saint Nick! Finishing approx 4 x 4, this is stamped onto very dark and distressed Weaver's cloth, so if you leave a bit of border showing... it'll look old and neat. Santa takes 15 skeins of Weeks overdyeds -- lots of deep reds and greens! 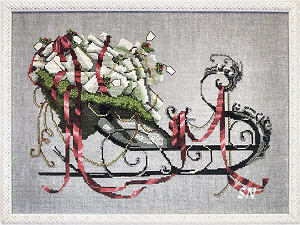 Teresa Kogut is a new addition to our Punch Needle Department! Her designs have such personality... you can just 'hear' what all the characters are saying in her pieces! Be sure to check out the rest! Homespun Elegance's 2006 Sampler Ornament, this year's design features the watchful angel above in the sky... a cool big golden star in the background of the house, a Colonial Knotted wreath on the front door, and a little knotted wooly sheep! Offered as the chart with angel charm, this finishes approx 3 x 3-3/4 on 28ct. We still have some 2005 and 2004 ornaments on our Homespun Elegance page... and quite a smattered collection of previous year's ornament designs... but you'll need to call with availability on those... too much to list in an e-mail -- and the selection changes all the time! Now... we are beginning a new auto-ship for this set of "Chillville's" 4 patterns. 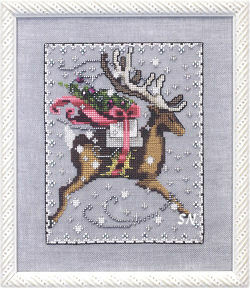 You'll receive The Chalet, the fabric cut, the embellishment pack, (no price as of my words this morning) and border chart with your first shipment. The other three will just contain the cards. Anyhow... join the auto.. this is going to be CUTE!!! The Winter Chillville fabric cut is actually a 1/6 yd piece of linen measuring 12 x 27, slightly larger than 3 inches of allowance of each side... but economical to cut! Happy Christmas to All! Bent Creek's newest holiday greeting is offered in leaflet format, with the darling clay embellishments, as an additional treat! Stitched on 32ct linen in Weeks Brick, Rum Raisin, Bark and Juniper, along with Dried Thyme Sampler Threads, it measures approx 2 x 17. The clay buttons are especially festive this time around, because there are so many new ones included! There are some awesome trees, a 'swirly thing' and ornaments, a cookie and a swirled candle -- real, real cute! The seventh annual set of three paper Santa Ornaments has been released! We've had 18 so far... and these three bring the set to 21! Always finishing approx 3 x 5 on perforated paper, and stitched with DMC flosses, these feature very few bead embellishments, and always a 3-D beard treatment! Offered as complete kits of pattern, paper, flosses and beads, they've stood the test of time... and just keep selling all year long! Very good looking on a Santa Christmas tree!!! Browse the the Mill Hill pages to see all the other sets in this series! The 2005 set of miniature mitten ornaments has arrived! This year's set is stitched on red, green and brown perforated paper for a splash of new color! (Look closely at the very edge of each design... you can tell which color of paper each uses.) Cute, cute...lots of teeny beads and a gold charm or white snowflake embellishment, these look really nice on the Christmas tree... because they're a nice size. Finishing approx 2 x 3... check out some of the previous sets from years past, too! What a charming winter scene!!! Reminiscent of Crossed Wing's Frosty Feast design, this is a detailed, shaded snowman, complete with a wooly green scarf and hat set. His faithful companions, the dog and bird, are stitched with just as much detail and color shading as he. Crossed Wing really has a flair for the realistic, and this design is full of that flair and has fantastic winter charm!!! Finishing approx 4 x 5 on Snow Squall Linen, Mitten Games is offered as a chart, with linen separately. 2000 Years ago, the Angels sang, Shepherds watched, and Wise Men came. This leaflet is a compilation of the consecutive set of Shepherd's Bush ornaments that have appeared in previously published Just Cross Stitch Magazine Annual Ornament Issues! Now out of print, the designs have been released back to SB, and are now here as the set... and sooo endearing! Stitch each individually, or stitch the set. These are full of Shepherd's Bush charm and color. Each does feature a delicate sterling charm... and you'll probably want all those, too! 2000 Years features the Shepherd's Crook charm. Angels Sang features the horn. Shepherd's Watch has a darling lamb, and Wise Men Came features a tiny Arabian-looking lamp! Each ornament is stitched on 32ct Linen, and has been 'digitally remastered' to include overdyed threads that weren't originally called for !!! Verrrry nice! Two Holiday designs that have so much flavor!!! 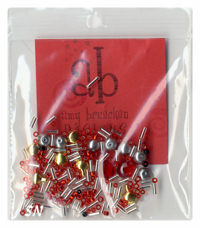 Each is available as a chart with all the charm embellishments shown, included in the pack. 12 Days of Christmas features tiny casted charms that follow the verses of the popular song! Both finish approx 3 x 13. Hinzeit has quite a collection of designs like these... make sure you see the rest! from Shepherd's Bush Two charming Merry Christmas greetings, you can stitch both or choose your favorite! Stitched on 28ct linen in shades of Weeks Overdyeds and Gentle Art Sampler Threads, each features a pack of handmade clay buttons from Just Another Button Company! Finishing approx 2 x 14"... Santa's design shows teeny stockings, snowflakes and holly, a candle, snowman, and a few other things, like stars. Colors used include some of the deep holiday shades of Garnet, Cranberry, Blue Spruce and Juniper. Bethlehem Christmas -- which features a stitched angel, shepherd and tiny city of Bethlehem -- uses the Shepherd's-Bushy Antique Rose, Highland Heather and Plum color scheme. I love both of them! Available as individual leaflets, with separate embellishment packs... your fabric color choices can vary with these... depending on your personal preferences. Our shop models are being stitched on Lambswool, but if you'd like a pastel mauve or lavender for Bethlehem, or a deeper taupe or mocha for Santa... just let us know! I love this! Stitch the alphabet, laced with Christmassy greenery, popcorn and even a fat little elf! The sixth in this set of designs, the rest are pictured on our Bent Creek page... and have remained stitcher's favorites! Stitched on 32ct dirty linen, it finishes 2 x 17... long and skinny. Christmas Row, and all the rest are available as single charted leaflets. The embellishments are just darling! The gals at Abecedarious in GA have done a great job choosing several new buttons this time around. There are four kernels of popcorn featured as well as two new Christmas Cookies! Lots of teeny holly leaves, pine cones and light bulbs... you'll love the set! Here's a project for the dedicated stitcher! While I personally can't sit still long enough to stitch a pattern like this, so many of you can! When Jeanne, our stitcher, returned this to us, we were breathless with it's beauty! 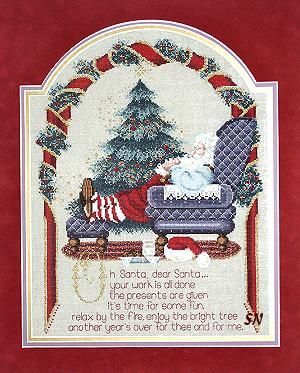 Santa is resting after his big day, in a big plump easy chair, in front of his festive tree. The ribbon border surrounding him has wonderful gold metallics all through it, the tree just glistens, and the shading in his chair gives it such depth. Good-sized, just like all the rest of L & L's charts, this finishes approx 13 x 16 on 28ct. It features several metallics, nine of the Needlepaint flosses, and a few Mill Hill glass beads. It's truly a work of art! Availability of all the extra threads varies -- they're all hard to keep in at one time. Get the chart first, check your stash, and then let us know what you need! This has been a customer favorite of ours for years and years! 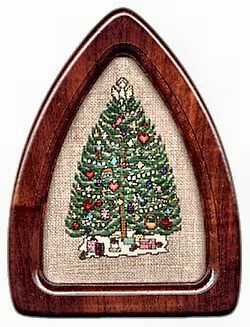 A beautiful deep green Christmas tree stitched over one thread on 36ct linen, the arched wooden frame is included in the kit! The design is very intricate, full of sparkly metallic ornaments of reds, purples, blues and golds and lots of tiny details. It finishes just a little under 3 x 4," and the hand-rubbed walnut frame measures 4 x 5." Complete kit includes the fabric, cotton and metallic flosses, 36ct linen, and the frame. This is a collection of perforated paper Santa kits, three are released each year. Full of color, detail, and fun bead embellishments, these are charming! Each santa finishes approx 2 x 4" on 14ct perforated paper, and when cut out, look fantastic on your Christmas tree! Complete kits, you'll need them all! 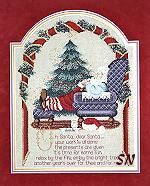 We have an awesome selection of all sorts of different Christmas Stocking patterns by various designers in our cross stitch industry. Visit our Christmas Stockings page to see collections by Shepherd's Bush, Just Nan, Sam Sarah Studio, Lizzie Kate, Bent Creek, Birds of a Feather... and more. Just so many cute ones! All are offered as leaflets or chart-packs. We carry all the necessary fabric, threads and embellishments... and are happy to gather everything together for you. When your stitching is complete... do you need your stocking sewn together?? ?